The Leader's Dinner - the questions and my answers. 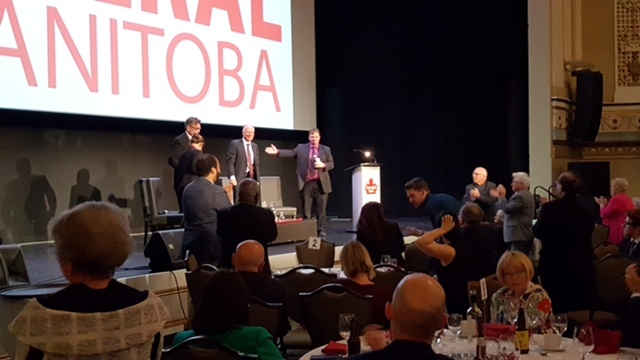 Thursday evening, the Manitoba Liberal Party - Leader's Dinner at the Metropolitan Centre was a chance to meet myself, Cindy Lamoureux and Dougald Lamont - the three contestants for the Leadership of our Party. The event was well attended. We were each asked a series of questions by Scott Newman. Below are the questions I was asked and my responses. Scott Newman: "Jon, I think everyone in this room knows you, and probably everyone in the Province knows you. MP for four years, MLA for going on 18 years now. Leader through four elections with challenging results. Why are you running again for Leader, and what's different?" Jon Gerrard: For our party, having a leader who is well known all over the province, and who is experienced and knowledgeable is an advantage. In my years in politics, and particularly since I stepped down as leader in 2013, I have learned much. I am a better politician and leader now for having had four years away. My people and leadership skills have improved. I’m a stronger communicator and a better strategic thinker. We, as a party, have a major opportunity in the election of 2020. We need the leader who Manitobans will recognize and see as most ready to govern. I believe I am that person. Scott Newman: "There's a lot of changes happening right now in health care in this Province - Pallister has refused to release the KPMG report, lots of discussion about ER closures, program cuts, etc. - where do you stand/what do you have to say to voters or to Brian Pallister about the state of Manitoba health care coverage"? Jon Gerrard: The Pallister approach is like a bull in a china shop. We need a better principled approach. Good leadership should result in health care workers who are respected, happy, excited and inspired to do well – not workers who are made nervous and anxious by a hacking, slashing, thrashing government. As a physician I understand how to achieve excellence in health care – and yet be wise in spending. For example, spending one dollar on keeping people with Chronic Obstructive Pulmonary Disease health, saves 20 dollars. I understand the critical importance of putting patients first and making wellness and preventing sickness central. I stand for positive change in health care, and for putting the HEALTH back in health care for our patients and for our health professionals. Scott Newman “The third topic will be about Education. Where do you see education now and where should it be going. If you could make a change to our system of education, what would it be". Jon Gerrard: First, I, like Cindy, believe the Tuition rebate cancelled by the Pallister PCs needs to be reinstated. Rather than reinstating it precisely as it was, I would consult with students to see if the approach can be improved. Second, we need to rethink education in the digital age. It needs to be more integrated from pre-school, through to post-secondary and life-long learning. It must be more flexible, more responsive to individual needs, better able to adopt good practices and connected to our communities' skill needs. I talked recently with Lloyd Axworthy. There is not a system for on line learning in Manitoba. We need a centre for learning and for design in Winnipeg which combines in class and on line learning and links to all the resources available at a post-secondary education level and which can function, as happens elsewhere as an incubator for ideas, for creativity and for businesses. I stand for positive, progressive change in education. Scott Newman: “The fourth substantive topic will be about the Environment. Lots of voters in Manitoba are concerned about the Environment, The Green Party averaged nearly 10% of the vote in constituencies where they ran a candidate. Where do you see changes needed on environmental policy in Manitoba?" Jon Gerrard: As a politician and an environmentalist, as a recipient this year of the Anne Lindsay Protecting our Earth Award, as one who has been endorsed by Michael Paterson for my work helping save the Experimental Lakes Area, I will attract those concerned about environmental issues. Two more points. First, fundamental to saving Lake Winnipeg is ending the dumping of raw sewage from Winnipeg into our Red and Assiniboine Rivers, and ensuring all hog manure is injected into, rather than spread on to the land. Second, it makes sense for Manitoba to lead in the development and use of electric cars and buses. It will increase the demand for hydroelectric power from Manitoba Hydro and will position us well as a province for the economy of tomorrow. I stand for positive, progressive change for our environment. Scott Newman: “The fifth topic will be about where you'll take the party, should you win the Leadership. Party members in this room will be coming out to vote on October 21. They want to know where you'll take the Party, and your plan for the 2020 Election. If you're chosen leader, how are you going to prepare the party for the 2020 election? What's you plan to take on the Conservatives and the NDP?" Jon Gerrard: My plan is to move swiftly to set up renewed, revitalized, restructured election readiness and candidate search committees which will bring together strong people from each of our campaigns and from the board. I commit to have most of our candidates nominated by the end of next year – 2018. My plan is to train the next generation of fundraisers, and be creative and effective in building the war chest we need for the election. Organizationally, I will work with the board and set up a team to focus on having active constituency associations all over Manitoba. My plan is to focus, in our communication, on highlighting our team and our stars including Cindy, Judy, Dougald, Paul Brault and candidates as they are selected. My plan is to work together with our federal colleagues to build a provincial party which can support them and which will win the provincial election in 2020. YES. If I am not the new leader, I will support our new leader with all my energy and experience for the benefit of our party and for all Manitobans. I am a team player and I look forward to working with Cindy and Dougald and with Judy Klassen and with Paul Brault and our Board. Fellow Liberals: After time off to rethink who I am and who we are, I am re-energized and ready to bring my knowledge and experience and to lead. We are a diverse party with incredible potential. We need to remake ourselves so that Manitobans see us as having the discipline, the teamwork, the communication and the vision to govern. The back fighting, infighting and personal attacks on members, including board members must end. We are one party, and we must be together to succeed. We need to develop a culture of welcoming, so that whenever someone comes forward we have an opportunity for them to join us and to be part of positive change. We need to have a culture of respect for our Board – who are volunteers and putting in long hours and considerable dollars to make this party what it can be. It is not the Board's fault that Pallister cut our subsidies and is making life difficult for us. Let us attack Pallister not our own board. 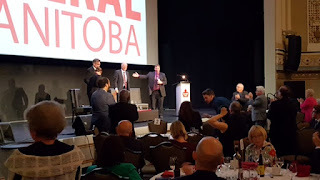 We need to rethink how we operate as a party and how we generate the organization and the war chest to fight for the many Manitobans who are calling out for better than the PCs are giving and better than the NDP gave when they were in government. 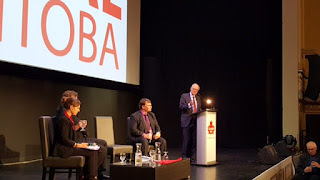 I will undertake to work with Paul Brault, with Cindy and with Dougald to leave no stone unturned in opening up our party to new ideas from our members so that we can rethink and reset every aspect of what we do as the Manitoba Liberal Party to create the drive to succeed and a more welcoming culture at Molgat Place and around the province. I ask you to join me to be a part of positive change – to be part of the drive to reinvent and reinvigorate our Manitoba Liberal Party to achieve a culture of excellence to enable us to win in 2020. I am well known all over Manitoba. I have the credibility. I have the experience, the knowledge, the energy, and I am ready now to take on this task so all of us can come together – unified – focused – and successful in 2020.